David Haye's hopes of unifying the heavyweight division before his planned October retirement have been hit by the Klitschko brothers' latest fight deal. 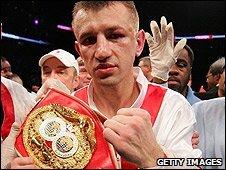 Tomasz Adamek, 34, will challenge one of the world champion Klitschkos in Poland in September. Wladimir Klitschko, the IBF and WBO champion, fights Britain's Dereck Chisora on 30 April and WBC belt-holder Vitali meets Odlanier Solis in March. It means WBA champion Haye is running out of time to face the Ukrainian pair. Haye, 30, had been close to agreeing a 2 July date with Wladimir before the younger Klitschko brother opted to face the inexperienced Chisora in Germany. Will Haye ever fight a Klitschko? If both Klitschkos were to lose their next fights, the deal with Adamek would be dead. If one loses, Adamek would face the other brother. If both brothers win, the choice of Adamek's opponent would be decided by the Klitschko side. Poland's Adamek has one defeat in 44 fights with 38 knockouts and his fight with a Klitschko brother will take place at one of the venues built in his homeland for the 2012 European Championships. "I am very happy," said Adamek, a former light-heavyweight and cruiserweight world champion. "I would like to thank the Klitschkos for being very generous with the percentage offer. I am looking forward to this fight. "It doesn't make a difference to me which Klitschko I fight. Right now they are both the biggest stars in the boxing world and I want to fight the biggest stars. I'm grateful for the opportunity." Vitali Klitschko added: "Adamek is very experienced, fast and a hard-punching opponent. "Whether it is Wladimir or me, we have to be very concentrated during the entire fight. It is fantastic that a Polish and a Ukrainian boxer will be together in the ring." In contrast to the protracted, troubled negotiations between Haye and the Klitschko camp, Adamek's promoter Kathy Duva said she had no problems reaching an agreement. "I didn't have any of the problems other people talk about," said Duva. "I've had a long relationship with [Klitschko adviser] Shelly Finkel for something like 30 years and that probably helped. "But when the time came to talk to Klitschko manager Bernd Boente, we were in synch right away. "I know how to get a deal done. I didn't have any problem with them at all. And I had a fighter who said, 'this is what I want, please go out and get it'."